Y’all never seem to understand how frustrating it is to have to deal with you. After working at Pandora, for these past couple of months, I have been able to see the truly ugly side of all of you retail customers, and simply humans in general. It seems to be even worse, since I am working in Bellevue Square, where it is known for rich and privileged people. The amount of times I have had to hold my tongue from snapping back at a you is countless. There has really not been a work day that goes by, where someone at my work, doesn’t have to deal with someone as rude as yourself. I’m just sorry for you, that you have nothing better to do with your life, than complain about something so insignificant, like a bracelet not fitting correctly, or that you have to just wait a few minutes to get some help, even though there is a very long line of people in front of you. It seems like the amount of patience I have is simply not enough to withstand the annoyingness of all you cranky customers. You seem to complain on and on about prices that are too high, or how you wish that we still have one charm instock. Everything that you seem to complain about is not something that, us as employees are not able to fix. The rules and regulations were set by the CEO of Pandora. If I was able to just give you the discount on a charm, I would have done so from the beginning, just so I would not have to hear your annoying, high pitched voice. Or so I would not have to look at your gross box dyed hair and ugly child that definitely got the ugly genes from you. I simply am not able to comprehend how you are able to be so upfrontly rude to someone else, just because we are working and helping you does not give you the right to treat us like trash. If I were any less of a kind and helpful employee, I would have already yelled back at you. However, since I am a much more civilized person than you, I simply continue to smile and nod, and pretend to be engaged in all of the garbage coming out of your mouth. No matter how bad I want to call you a stupid person, who had no knowledge of common sense or any sort humanity. The only plus side of having to deal with you, is that I have a great story to share with the rest of my coworkers. We all have a lovely time, sharing about how rude you are and how crazy you look, while complaining about some minor detail. Of course, having to deal with a customer complaining about some product is not the only way to tick an employee off. The amount of times I have asked how a customer is doing, to only have them completely disregard me is countless. It is simply very rude, and just because we are working doesn’t mean we aren’t people too. Of course, there is not much I can really do to combat this problem of rude customers. However, writing this letter gives me the ability to share my inner thoughts with all of you. I hope that by reading this, everyone is a bit more aware while shopping. Although, I do know that sometimes there are people out there that are simply just rude in general. There is not much anyone could do to deal with them, because there are people out there that just have their own inner problems, that make them the terrible people they are now. No amount of letters or complaints can change the way that they are. 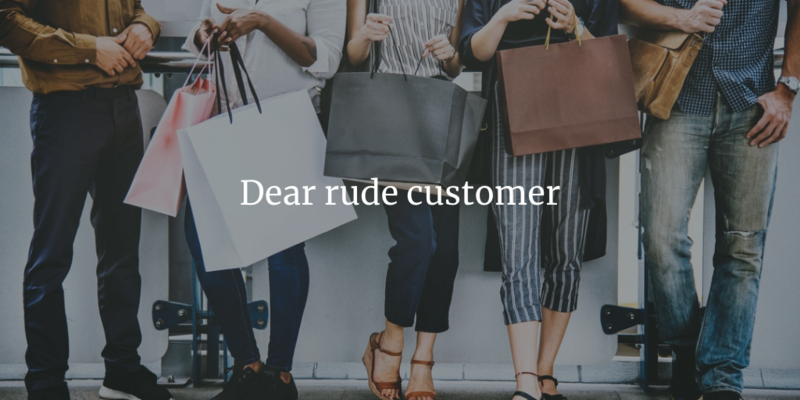 In the future, I hope that karma catches up to all you rude customers, and that one day you are working retail, and you are in your own position where you have to deal with a rude customer, just like yourself, so that you get a taste of your own medicine. However, although I really hope that one day I can somehow get revenge on all of you, I mainly hope that after reading this letter, you are able to realize the effects of your actions, and change your ways. It is really not that hard to be patient and friendly. It is simply just basic human kindness, to be a civil human being to others. Not just when it comes to retail interactions, but with interactions in general. I am guessing that not only are you rude to workers, but other people in general. I hope that after reading this, you are all able to realize your actions, and hopefully become nicer humans.